Strengths: You\'re gonna sweat! Great fun and focused exercise game. Weak Points: Great upper and lower body exercises but it needs more core body exercises. Moral Warnings: nothing to report here. There are numerous workout video games for the Wii gaming system, so what does EA Sports Active bring to the mix? After owning and playing Wii Fit and My Fitness Coach, this game brings some welcome changes to the exercise arena. 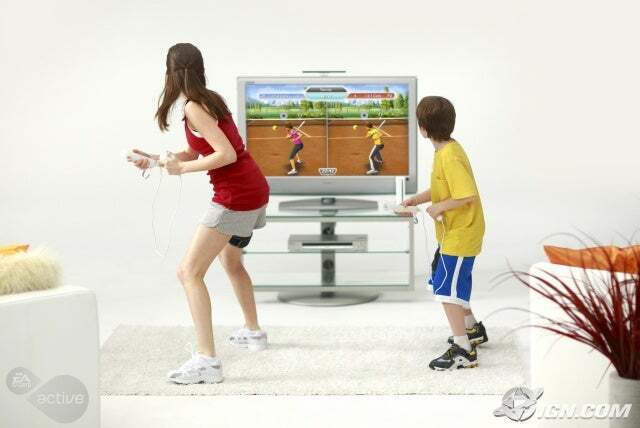 For starters, it does utilize the Wii balance board if you own it, and by using the Wii balance board you can do kick boxing moves and lunges with your tennis and volley ball swings. Using a resistance band is new to me and after going through my first 30 day challenge I think I need to tighten it or buy a tougher model to ratchet my workouts up a notch. Working out with a friend is a nice feature and at the very least they will need a Wii remote and a nun chuck but another leg band and resistance band would be beneficial. You can buy these in multiplayer kits that sell for $20. When you fire up the game for the first time you\'ll be setting up your fitness profile. This is where you can choose your male or female trainer, watch a video from the celebrity trainer Bob Greene, as well as set your weight and goals you wish to accomplish. The goals consists of the calories you want to burn, and how many hours and workout you wish to complete. I highly recommend starting off with the 30 day challenge. The 30 day challenge is in a journal format. There are a couple of quick surveys where you can log how many meals and drinks you consumed, how many hours of sleep you got and how relaxed you are. You can also record other activities you have done and get credit for them. It\'s in this journal area that you launch your pre-set workout for that day. Every third day is a rest day...phew! There are three levels of intensity and the highest intensity workout will get you sweating, guaranteed! Before you begin your workout you will see what exercises are in store for you and how many calories it anticipates you\'ll burn; I typically burned more than it assumed. The workouts usually go a little more than thirty minutes. There are pre-made workouts that you can do in 10 minutes to an hour and they are available in low, medium, and high intensity. Alternatively, you can create your own workout with the activities you enjoy doing, and you can set the intensity and see the estimated calories it will burn for you. The workouts themselves have a lot of variety and there\'s only so much sugar coating you can do to exercising. Although there are some fun sports activities, the meat and potatoes are the exercises that help tone you up. These exercises will not be fun to do but at least the music is good and they put you in a very relaxing and colorful environment. The exercises focus on cardio, upper, and lower body workouts. There are a couple of activities that will help with your core or abdomen area but I think it could use more...I think many mothers would agree with me on this one. The sports related activities include catching, throwing and hitting baseballs, shooting baskets and passing the ball, hitting with a forward and backhand in tennis, bumping, blocking and setting the ball in volleyball, boxing, and inline skating which involves crouching and jumping on ramps. Most of these work your upper body but if you have the Wii balance board you\'ll get a lower body workout as you do lunges in volleyball and tennis. The cardio dancing is fun and it can use the balance board as well making it an easier version of DDR. The majority of the focus is on moving your arms and hands while you dance. You\'ll be doing some dance moves like starting the lawn mower, raising the roof, the lasso, churning butter, and more. The other major cardio exercise is running laps and doing high knees and kickbacks along the way. Upper body workouts will consists of tricep and bicep curls, lateral raises, and upright/bent over rows. The lower body workouts will have you doing numerous squats, lunges and jumps. The squat holds are painful as they make you hold a squat for a minute. Graphically this game does a nice job. The scenery is very colorful and relaxing. When setting up your profile, you can customize the appearance of your character. There are different hair style and face shapes, clothes and accessories that can be applied. There are many helpful tutorial videos that show you how to do the exercises and you can always watch these videos again if you need a refresher. The background music variety is pretty good. I liked the techno and dance music. There\'s some rock and Latin music thrown in too. The music is mostly instrumental so there is nothing to worry about content wise. Appropriateness wise there is nothing to worry about here. Some people are concerned about yoga and there is no yoga to be found here. Although DDR is the most fun way to burn calories in my opinion, EA Sports Active is by far my favorite fitness game. The journal system will help you keep accountable to your eating and daily habits. Like many games these days, there are many achievements you can unlock by hitting X number of balls, burning X number of calories, workouts, etc. There\'s plenty of reasons to keep playing this game and I lost over 5 pounds since I started. I plan on continuing with this game but with a tougher resistance band.